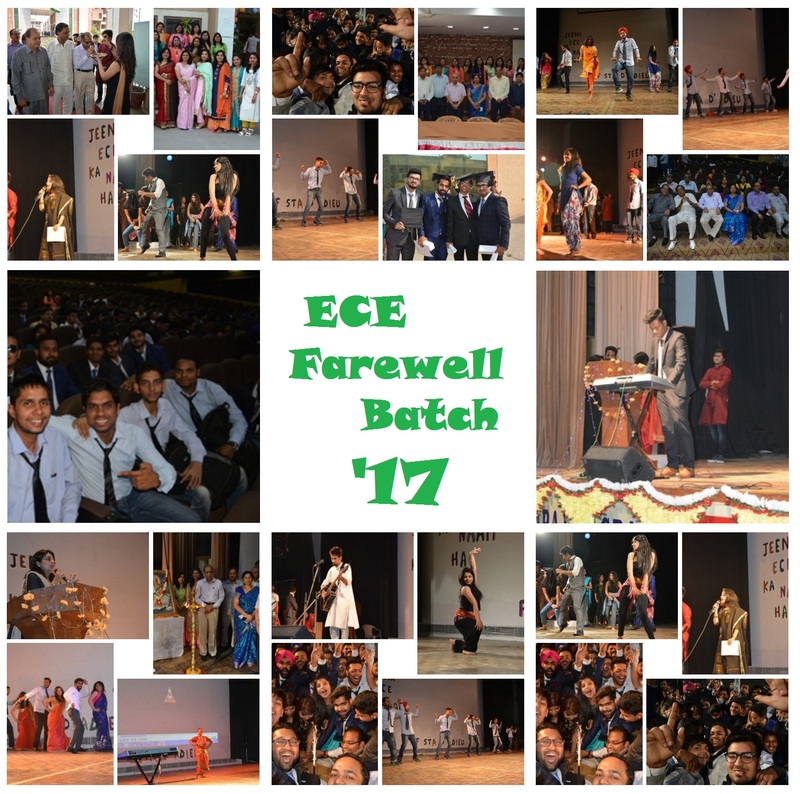 Farewell for the ECE department was held on the 5th of May 2017. The Event started with Mrs. Vatsala Khanna, Assistant Professor, ECE extending a warm welcome to all the students and teachers. The event began with lighting of the ceremonial lamp and with an ode to Goddess Saraswati. Our chief guests Sh. Sunder Lal Gupta, Sh. Gian Chand Aggarwal, Sh. Satnarain Garg, Director General, Director, Dean and Heads of all departments were felicitated with bouquets. A welcome address was given by our Head of Department, Dr Neelam Sharma. She thanked all the third and fourth year students to make the event a reality; she hoped that the four years spent in the college would be remembered fondly by the students. She urged the students to move forward in life despite negativity and build a monument out of the stones thrown at us. Our Director GeneralDr. M.L. Goyal congratulated the students that they would soon become engineers and asked them to be at the top of their game every time. Sh. Gian Chand Aggarwal and Sh. Satnarain Garg also motivated the students with their thoughts. Dr R S Gupta urged students to perform to their fullest potential and gave them some tips to survive in a corporate world. Before starting with the ceremony, the cake was cut, which was enjoyed by students and teachers alike. A short film made by the third year showcased the journey of their seniors through the four years. Next were a series of beautiful song and dance performance by the third and fourth year. It consisted of a fusion dance performance, many hilarious dance performances by fourth years., soulful music performances with popular songs such as Channa Meraya. There was also a very emotional speech by a student of the outgoing batch, which expressed hope for his batch mates and a promise to meet again. Sache’s were given to the deserving student of the outgoing batch with titles such as Mr Popular, Ms Popular etc. In the end all the students of the outgoing batch were given a graduation cap,a gift and a certificate by the college.